Genever is Dutch for “juniper.” Just because it is juniper-dominated, don’t go thinking of it as Dutch gin. Genever is a clear, botanically rich, malted grain-based spirit that can only be made in Holland or Belgium. It is a blend of two or more distillates: first, a whiskey-like triple distillate made of corn, wheat, and rye (so-called malt wine). Second, a juniper-infused distillate. A possible third part can consist of malt wine re-distilled together with different botanicals. Essentially, you can think of genever as the lovechild of a marriage between whiskey and gin. People love gin and whiskey, so combining flavors of both is bound to be absolute perfection in a glass, or, at least, certainly authentic. In 2008 the Dutch Government and EU created an official AOC (Appellation d’origine contrôlée) for Genever which defines exactly what genever is and where it can be made. Just as Champagne or Cognac, Genever is now protected by law, which means it can be produced only in certain regions: Holland, Belgium, and very specific areas of France and Germany. The AOC divided genever into two distinct categories (exclusive to The Netherlands and Belgium): jonge or “young genever,” which can contain no more than 15% malt wine and 10 grams of sugar per liter, and oude or “old genever,” which must contain at least 15% malt wine and no more than 20 grams of sugar per liter. The terms ‘young’ and ‘old’ don’t refer to any aging of the spirit, but rather the new or old style of making genever. Just because it is juniper-dominated, don’t go thinking of genever as “Dutch gin”, and do not use it as a substitute for gin. The malty flavors of genever are more reminiscent of whisky than gin, so refrain from using genever to mix a Vesper or a Gin & Tonic. Well, genever is actually the ancestor of gin. HERE you can read about the evolution of gin from Genever. Although they are both spirits accented by juniper, they are very different animals. Gin is created by mixing a neutral spirit base with a blend of botanicals, predominantly juniper. Genever has a completely different base – malt wine (distillate of rye, corn, and wheat), which is more representative of a blended bourbon or light scotch. The base is whiskey-like. The malt wine is then blended with a neutral spirit and a botanical mix to craft a spirit that tastes like the love child of gin and whiskey. There are two types of jenever: oude (old) and jonge (young). This is not a matter of aging, but of distilling techniques. Around 1900, it became possible to distil a high-grade type of alcohol almost neutral in taste, independent of the origin of the spirit. A worldwide tendency for a lighter and less dominant taste, as well as lower prices, led to the development of blended whisky in Great Britain, and in the Netherlands to Jonge Jenever. During WWII, lack of imported cereals, and hence malt, forced the promotion of this blend. Alcohol derived from molasses from the sugar beet industry was used as an alternative to grain spirit. People started using the term oude for the old-style jenever, and jonge for the new style, which contains more grain instead of malt and can even contain plain sugar-based alcohol. In modern times, jenever distilled from grain and malt only is labelled Graanjenever. Jonge jenever can contain ‘no more than’ 15% malt wine and 10 grams of sugar per litre. Oude jenever must contain ‘at least’ 15% malt wine, but no more than 20 g of sugar per litre. Korenwijn (grain wine) is a drink very similar to the 18th century style jenever, and is often matured for a few years in an oak cask; it contains from 51% to 70% malt wine and up to 20 g/l of sugar. Although the name oude jenever does not necessarily mean that the jenever is, in fact, old; there are some distilleries that claim that their jenever is aged in oak barrels. Malt wine is based on a mixture of equal volumes of Corn and Rye and Malted Barley grains and distilled in potstills. Alcohol strength is between 46%-48% abv, and has a very strong malted grain flavor. Grain alcohol is distilled in a column still and therefore has an alcohol strength of 96%. It has a neutral taste. Rye (Dutch: Rogge): provides a strong and a bit harsh flavor. Malted Barley (Dutch: Gemoute Gerst): Malted barley is necessary as it contains the enzymes which are critical to the fermentation process of Rye and Corn starch. Corn (Dutch: Maïs): It does softens a bit the harsh flavor of Rye. Using only corn would result in a Genever which lacks character. 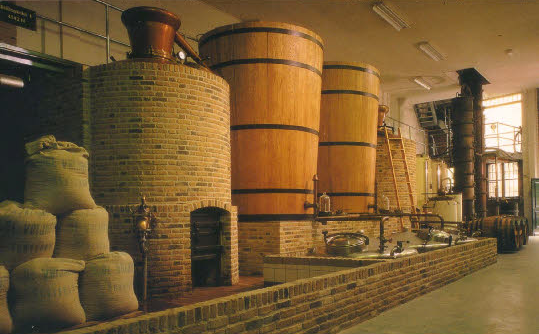 Jenever was originally produced by simply distilling malt wine (moutwijn in Dutch) to 50% ABV. The resulting spirit was not very palatable due to the lack of refined distilling techniques (only the pot still was available), so distillers added herbs and spices to mask the flavor. Among these, they used the juniper berry, jeneverbes in Dutch (which comes from the Latin Juniperus), for its alleged medicinal benefits. Hence the name jenever (and the English name gin). First sold as a medicine in the late 16th century, many believe that Genever was invented by a Dutch doctor and alchemist named Sylvius de Bouve. The problem with this theory is that Dr. Sylvius was born in the 17th century and that during his fourteen-year tenure as a professor at the University of Leiden, his research included distilling medicines with juniper berry oil, but none of his research papers contain any reference to jenever. The dates also do not add up: Dr. Sylvius certainly was not the first to distil with juniper or call a concoction jenever, as proven by written references to jenever in 13th century Bruges, Flanders (Der Naturen Bloeme) and 16th century Antwerp, Flanders (Een Constelijck Distileerboec). The latter contains the first printed jenever recipe. Additionally, in 1606 the Dutch had already levied taxes on jenever and similar liquors which were sold as alcoholic drinks, suggesting that jenever had stopped being used only as a medicinal remedy many years before Dr. Sylvius was even born. Genever’s prevalence can also be observed in Philip Massinger’s 1623 play, “The Duke of Milan”, which references “geneva”. Geneva was the Anglicized name for jenever, which British soldiers had brought back with them upon returning from battle in the Low Countries in 1587 and again during the early 1600s. Dr. Sylvius would have been just nine years old when Massinger’s play opened. So while the legend of Dr. Sylvius’s “medicine” may be more myth than fact, it has become the tale most people know. The Nationaal Jenevermuseum Hasselt in Belgium states unequivocally that jenever was created in the lowlands of Flanders in the thirteenth century. Their claim is given credence by commentary in ‘Jenever in de Lage Landen’ by author Prof. Dr. Eric Van Schoonenberghe. 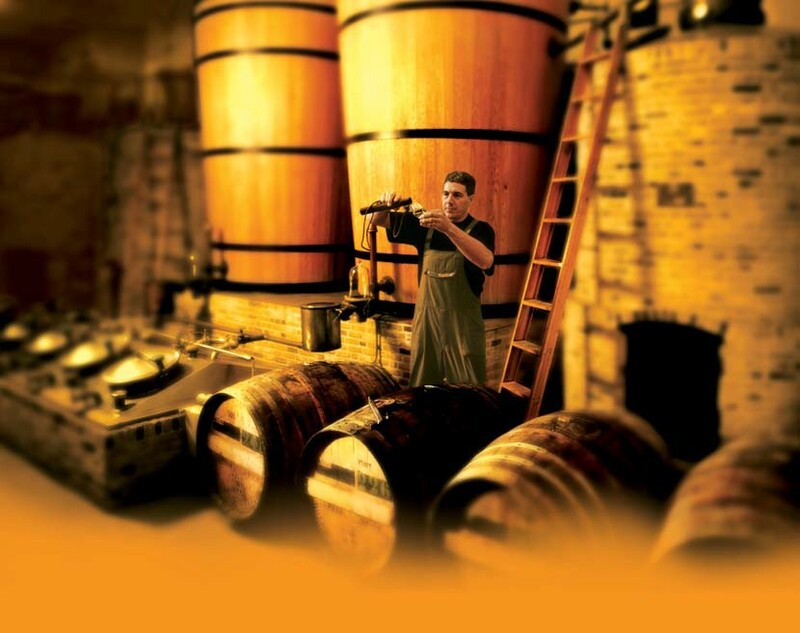 The transition of grains into a fermented wash and distilled malt wine: Takes place in a place called the “Branderij”. This is a typical Dutch word which does not exist in English, i.e. it is simply translated as “Distillery”. Also the malting process of the grains took place in the “Branderij”, and was not performed by a specialized company as we see in modern times. The maltwine is then re-distilled in the “Distilleerderij” (Distillery) in combination with Juniper berries and other botanicals into Genever. Distilling the wash from malt, corn and rye in a Pot-still (Ruwnat). Second distillation in the Pot-still (Enkelnat). Re-Distilling part of the Maltwine with botanicals. Re-Distilling part of the Maltwine without botanicals. Re-Distilling part of the Maltwine with Juniper-berries. Blending all four components together according to a secret proportion/recipe. The original and unique flavors of Genever enable bartenders to work with the authentic flavours of the past and to recreate the true classic cocktails as they were meant to taste – The Original Collins, for example – or invent new, well-balanced contemporary cocktails. The whisky-like malt tones of Genever make it also perfect to drink it straight, on the rocks, paired with a beer or in ‘regular’ easy mixed drinks like a Dutch Coke or with ginger ale, as well. Find HERE many cocktails recipes to best have By the Dutch Old Genever.